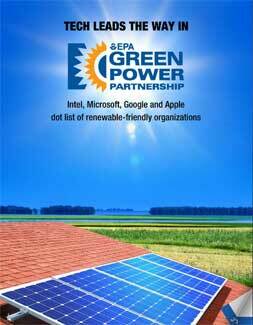 Intel, Microsoft, Google and Apple dot list of renewable-friendly organizations. The U.S. Environmental Protection Agency’s (EPA) Green Power Partnership’s updated list of top 100 organizations includes those choosing to use electricity from sources like wind and solar power. 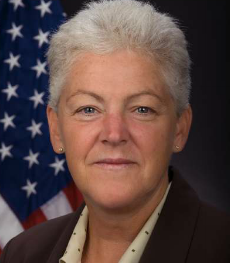 “By using green power, these companies and organizations are showing that business can flourish while taking meaningful steps to reduce carbon pollution,” said Gina McCarthy, EPA administrator. Intel Corporation continued a seven-year run as the nation’s largest voluntary user of green power, meeting 100 percent of its electricity load with renewable resources. Other technology companies in the top 10 include Microsoft Corporation (No. 3), Google Inc. (No. 5) and Apple Inc. (No. 8). Apple increased its annual green power use by nearly 100 million kilowatt-hours and moved from No. 11 to No. 8. The combined green power usage of the top 100 partners amounts to nearly 24 billion kWh annually, close to 83 percent of the green power commitments made by all EPA green power partners. The list is calculated based on annual green power usage (in kilowatt-hours) by green power partners. Rounding out the top 10 are Kohl’s Department Stores at No. 2, Whole Foods Market at No. 4, Wal-Mart Stores Inc. at No. 6, Staples at No. 7, the city of Houston, Texas at No. 9 and the U.S. Department of Energy at No. 10. For the eighth straight year, EPA is also encouraging increased green power use among higher education institutions through the College and University Green Power Challenge. Out of the 33 competing conferences, the Big 10 was conference champion, collectively using more than 309 million kWh of green power annually and avoiding carbon pollution equal to that produced by the electricity use of more than 30,000 American homes. The University of Pennsylvania was the top individual school in the challenge for the seventh year in a row, purchasing more than 200 million kWh of wind power annually – more green power than any of the 78 other competing schools. The Green Power Partnership has launched the On-site Renewables Challenge, with a goal to double the use of on-site green power by partners by the end of the decade. As part of the challenge, EPA is inviting partners to increase the amount of energy they produce and use from on-site renewables by the end of the decade. Green power is a subset of renewable energy and represents the renewable energy resources and technologies that provide the highest environmental benefit. EPA defines green power as electricity produced from solar, wind, geothermal, biogas, eligible biomass, and low-impact small hydroelectric sources. More than 1,200 organizations are purchasing more than 28 billion kilowatt-hours of green power annually, avoiding carbon pollution equal to that created by the electricity use of more than 2.4 million American homes.